I've very recently upgraded from FontCreator 7.5 to 11.0, and am noticing a couple of differences in 11 that seem to be bugs rather than deliberate changes, which are affecting my use of the program negatively. Firstly, when using the stock Draw Rectangle and Draw Circle tools, their contour direction seems to be randomised rather than always being clockwise - I tried to find some rhyme or reason to whether they are drawn clockwise or counterclockwise/negative, but couldn't work anything out. 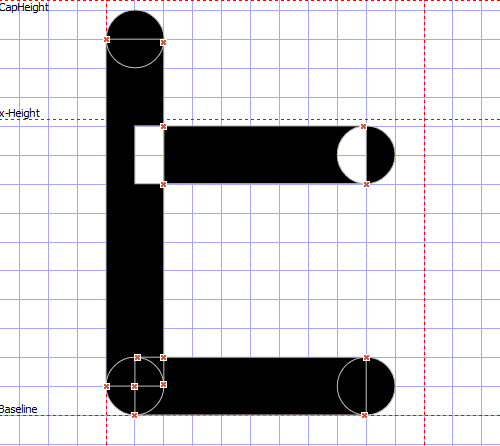 Fairly problematic for me as I create a lot of geometric fonts, and the random directions mean that, rather than being able to draw everything in one direction then reverse the "holes" in letters, I now have to check every single shape as it's drawn. A more minor one, but one that's infuriating me - if I select multiple shapes, copy them, paste them and then attempt to move them, even though all of the shapes are selected it only grabs one of them, leaving the other shapes overlapping the original copies. Finally not a bug, but is it possible to downscale the icons in FC11 to match the size they were shown in FC7.5? While the new ones are prettier, I'm not on the highest-resolution monitor and am used to having my windows fairly small to compensate. Not too big a deal if not, I'm sure I can get used to the new size. NAL wrote: Firstly, when using the stock Draw Rectangle and Draw Circle tools, their contour direction seems to be randomised rather than always being clockwise. It's not a bug, the direction is not random, and it's a feature. You no longer have to reverse the direction of interior contours since FontCreator does it automatically. For quadratic curves, interior contours will be counter-clockwise, and for cubic curves they will be clockwise. NAL wrote: A more minor one, but one that's infuriating me - if I select multiple shapes, copy them, paste them and then attempt to move them, even though all of the shapes are selected it only grabs one of them, leaving the other shapes overlapping the original copies. NAL wrote: Is it possible to downscale the icons in FC11 to match the size they were shown in FC7.5? The smallest icons are 24 pixels. The largest are 48 pixels for high resolution monitors. There is not option for smaller icons. My most recent video tutorials use a window of 1196 x 952 pixels, which is the smallest size that allows all of the docked toolbar to be displayed without scrolling. If you look at the videos, you can get some ideas how to arrange the toolbars to maximise space on a small monitor. What is the resolution of your monitor? Yeah, since posting I found out that keyboard movement still works, which is great. Definitely still an issue I'd appreciate being fixed though - I use gridlocking a lot when designing fonts, so mouse movement of shapes is still precise for me. The smallest icons are 24 pixels. The largest are 48 pixels for high resolution monitors. (...) What is the resolution of your monitor? I'm on 1600x900, although I tend to run multiple programs so I barely ever have FC fullscreen. Is there a way of manually switching to the 24x24 icons you mention? Believe it's using the 48x48 ones for me. With the next upcoming release we will make some improvements to this. If a contour overlaps, FontCreator will then no longer try to fix the contour direction for contours that overlap. In such case a contour direction will become clockwise if you started the contour from upper-left corner to bottom-right. Etc. The bug will also be solved. For now we prefer the new icon sizes. Do show us a screenshot, so we can see how it looks on your monitor. I'm using a 1600 x 900 laptop much of the time. It uses the 24 x 24 icons. My Windows scaling is 100% (I think) but don't have an opportunity to start it up at the moment to check. Grabbed the new update, the change to the automatic contour direction works perfectly and the bug is indeed solved, which is awesome - thank you very much. After the update, their direction is still reversed when they overlap. The updated version, as Erwin stated, only does this reversal now if you draw the shapes in a certain direction. Last edited by NAL on Wed May 24, 2017 2:14 pm, edited 1 time in total. NAL wrote: Grabbed the new update, the change to the automatic contour direction works perfectly and the bug is indeed solved, which is awesome - thank you very much. I'm glad it solved the issue. Perfect! Even for us it took a while before we got used to the new icon set, but we are used to it, we're glad we no longer have to see and use the smaller old-fashioned icons. This new version, in my opinion, is absolutely perfect - I could have got used to the first update basing rotation on which diagonal you drew the shape with if it partially overlapped something, but even then, it seemed unlikely you'd ever want a shape to have its contours reversed unless it was completely within an existing shape. Perfect. Thank you for letting us know!